Would be honored with your presence at the Golden Boot Awards. The Disco Fever themed event will be an evening of fun where our guests will enjoy an evening of dinner, live entertainment, dancing, and special "Golden Boot Award" presentation. 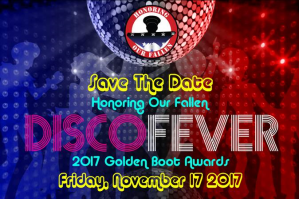 100% of the event proceeds will support programs and services for families of our nation's fallen. While there is nothing we can do to bring back their loved ones, we can do a lot towards bringing comfort to the families here at home by providing a community of support at their doorstep.